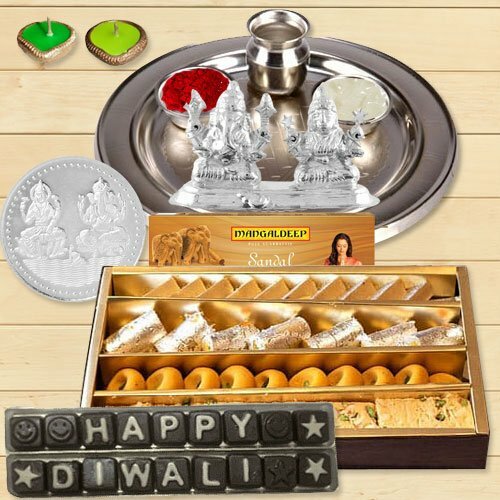 Send Diwali Gift of nicely wrapped Laxmi Puja Complete Hamper containing with Silver Plated Ganesh Laxmi Idol, Puja Samagri Kit, Special Silver Plated Puja Thali, Diya 2 pcs.with 100 Gms. Assorted Sweets and Happy Diwali Homemade Assorted Chocolates Gift Pack. Free Silver Plated Laxmi Ganesh Coin. Note: Thali Size 5 to 7 inch. Ganesh Laxmi Idol weight: 5 Gms each. Gross weight applies for Sweets. No. of Chocolate 18 pcs. Send Diwali Gift of nicely wrapped Laxmi Puja Complete Hamper containing with Silver Plated Ganesh Laxmi Idol, Puja Samagri Kit, Special Silver Plated Puja Thali, Diya 2 pcs.with 250 Gms. Assorted Sweets and Happy Diwali Homemade Assorted Chocolates Gift Pack. Free Silver Plated Laxmi Ganesh Coin.Note: Thali Size 5 to 7 inch. Ganesh Laxmi Idol weight: 5 Gms each. Gross weight applies for Sweets. No. of Chocolate 18 pcs. Send Diwali Gift of nicely wrapped Laxmi Puja Complete Hamper containing with Silver Plated Ganesh Laxmi Idol, Puja Samagri Kit, Special Silver Plated Puja Thali, Diya 2 pcs.with 500 Gms. Assorted Sweets and Happy Diwali Homemade Assorted Chocolates Gift Pack. Free Silver Plated Laxmi Ganesh Coin.Note: Thali Size 5 to 7 inch. Ganesh Laxmi Idol weight: 5 Gms each. Gross weight applies for Sweets. No. of Chocolate 18 pcs.